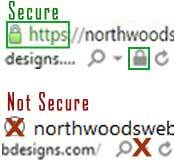 These domain validated certificates validates the relationship between the cert and the domain and provides the secure lock in the address bar showing the customers data is protected and encrypted. We are now able to offer a very budget friendly way to assure your customers that privacy and security are important to you. *This SSL certificate is only available to customers who host their websites directly with us, which allows us to provide this pricing & feature. RapidSSL is another budget friendly domain validated certificate that validates the relationship between the cert and the domain. In addition it provides the secure lock in the address bar showing the customers data is protected and encrypted. GeoTrust is a well known domain validated certificate provider. it also validates the relationship between the cert and the domain and provides the secure lock in the address bar showing the customers data is protected and encrypted.